It is 3:00 in the afternoon when I check in to the motel. I have in mind a gentle hike of a few miles, from a trailhead not far up the highway. But the desk clerk, a fit-looking young local, is dismissive. She has another idea. Unpacking in my room, I vacillate. My knees are still sore from my last long hike — something I’ve been noticing more and more lately. And it’s getting late in the day for a long drive up dirt roads into unfamiliar terrain, then a long, steep hike at altitude. But I can’t resist. I’ve spent a lot of time in the mountains recently. This is well within my capabilities. It just means a late finish to the day. Something I am prepared for. I am fit and well equipped. And so I go. My philosophy now is to “seize the day.” Who knows how many more of them I’ll get? The drive turns out to be a tortuous 45-min affair — 16 hard miles up increasingly rocky and rutted dirt road up to nearly 10,000 feet elevation in the heart of the southern San Juan mountains. As the miles pass by, I ponder turning back. Driving so far up into the big mountains, alone, sun sinking in the west, is unsettling. But I want to do the hike. And I am most of the way there now. If I don’t do it today, who knows when I’ll ever be back? Finally, shadows lengthening on the dirt track, I reach the parking area, shut off the engine, and crack the car door. A stiff, chill-ladened mountain breeze cuts through my T-shirt. I add long underwear and a puffy jacket to my day pack, check my headlamp. Then, shouldering the pack, I start up the trail, climbing through green meadows dotted with white and purple wildflowers. Next come stands of aspen. Then there is the fir and spruce — most already dead from drought and the pervasive beetle, the rest soon to follow. The scene is stunning yet heartbreaking. How can we accept this devastation to the most beautiful places on our planet? I never will understand…. 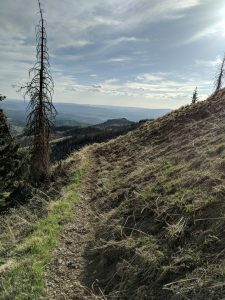 After about an hour of hiking, the trail begins snaking across precipitous and exposed slopes, aiming for a ridge still hundreds of feet above. I must turn around soon. There is barely time now to get back down before sunset. But the ridge beckons. From there I can likely see over into the next basin and perhaps up to the Divide. My head knows there is risk. But my heart wants to know what is above. I keep walking. If the greatest work of art ever created by a human rates a “10,” then a pristine alpine lake gets a “100,” in my opinion. In addition to the physical beauty, these places have a powerful emotional effect: The light, air, sky, rock, and plants make you feel fully alive and completely present right there. I never feel more inspired than when outdoors in the great ranges of the West. But, yes, these places also frighten me at times. They are bitterly lonely, stark, and unforgiving. They demand attention not just by their sheer beauty, but also because they can be lethal. Humans are only temporary visitors here. Yet, like a moth to the flame, I find myself drawn again and again to the beauty and the challenge. On the trail, I trudge upwards through another series of switchbacks as the shadows lengthen. I clamber over several downed trees, and then finally climb onto the ridge I had seen from far below. My high point is a narrow rocky outcrop, well over 11,000 feet. At last I can see up toward the Divide. There is rock. There is some snow. There are many more dead trees. The sun is low in the sky. The wind picks up and the temperature drops another 10 degrees. It will be dark in less than two hours. The lows tonight will be in the 30’s. If I twist an ankle or lose the trail up here, I could quickly be in a fight for survival. Why do I keep coming back to the big mountains? As the years pass, my identity is merging with these difficult but breathtaking high places. They, like my own life, are becoming more and more precious, more and more beautiful, and increasingly fragile. I too am the earth. Heading down now, slowly, carefully, I retrace the route back to my vehicle. First past rocky switchbacks, then through darkening forest and meadow. I take each step with care. Better to return a few minutes late, than not at all. When I finally unlock the car door, the sun is approaching the horizon and Venus — the evening star — is glowing in the west. Driving back to town in the the twilight, my headlights catch a burly bundle of cinnamon-colored fur aside the road ahead. It scrambles up the slope with surprising speed, quickly clawing its way up a Ponderosa pine that towers overhead. I can hear the animal breathing heavily and see ursine eyes sparkling as it peers down at me from its high refuge. It is only the second bear I’ve seen in five years of living out West. I roll on down the mountain, back to civilization for the night.